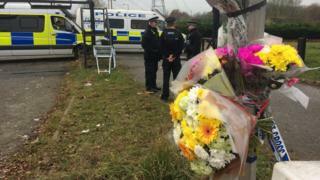 The sale of a travellers' site where two people were fatally stabbed should be completed by the end of October, a council said. West Meadows, near Ipswich, is owned by Suffolk County Council and the authority said it had spent £1.5m within 10 years on the site. The council said it had agreed to sell the site to a consortium of residents. A spokeswoman said it could not reveal the sale figure as it was "commercially sensitive" information. Nelson Smith, 18, was jailed in June 2017 for stabbing two men to death at the site with a carving knife during a row over a caravan pitch. As well as the two deaths, in May last year four men from the site were jailed after a pregnant horse was subjected to a "sickening and brutal slaughter".